Get Better Faster: A 90-Day Plan for Coaching New Teachers gives school leaders actionable tools to coach new teachers. Paul Bambrick-Santoyo knows the deep impact classroom teachers make on students, but also the reality that many new teachers leave the profession, in part due to lack of coaching and support. The book focuses on classroom management and rigorous instruction, and it includes real-classroom examples and videos. “Enrollment in traditional undergraduate education major programs is down by over 25% across the nation. We must be more intentional in developing the teachers in the classrooms without overwhelming them. 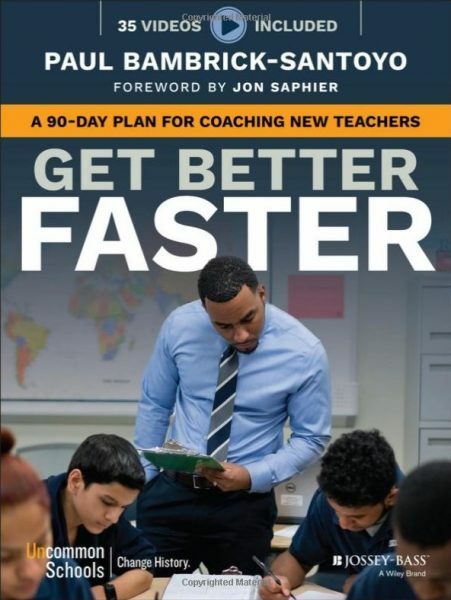 Get Better Faster provides clear starting points and a trajectory for developing teachers to be highly effective in the classroom,” said Alison Hiltz, Director of Queens SELA. In July 2017, Bambrick-Santoyo led a conference in Charlotte for leaders from CMS and Queens University, and we learned firsthand about the power of excellent, frequent coaching on skills.